Flashpackers Return Home with Flashbaby! It’s hard enough to stay current on a travel blog while you are actually traveling – never mind once you’ve returned home. Even after the shock of reality wears off and, worse yet, you start to feel as if you’ve never left, continuing your blog is something you want to do as a way to relive all those great adventures you had (yes, they really did happen!). But the pesky reality of life back home (looking for work and then actually being employed again, settling back into a routine and waking up to an alarm clock to go make money instead of catch a plane/train/bus to another city/country/adventure not to mention how fun it is to go through a year’s worth of mail and a bunch of boxes in storage) really gets in the way of writing.The great things about being home like seeing friends and family, not having to wear the same clothes for the millionth time (especially if they barely pass the sniff test) and not having to think about where you are going/how to get there/the proper way to purchase produce…and the simple fact that everyone understands you when you speak (and vice versa) are all pretty great. But it’s still a HUGE adjustment returning home after a one year journey around the world. What made our homecoming even more unique is that we came back pregnant. Yep, that’s right, the Flashpackers are going to become Flashparents. Flashbaby is due in August and was conceived in Spain (much to the disappointment of our friend and landlady in Portugal who has ordered us back when it’s time for baby number two). 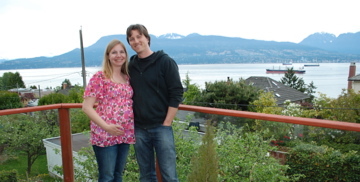 Between the demands of my job and the tiring effects of my ever expanding belly, I have completely neglected telling the story of the last months of our wonderful journey – which I will do – just not as quickly as I should. The last few months were some of the best. We received visitors from home in Spain who we had a blast with, spent Christmas and New Years in Portugal, a week in Barcelona, Valentine’s Day in Paris, a week in Nice, time in Brugge, Amsterdam and Berlin – all amazing cities. If anyone has a good suggestion (excluding my sister Shelley who’s enamored with “Bean”) for naming the baby, please comment! Returning home “back to normal” is always a bit of a shocker, although as you mention there are some good points too (for me was great to be able to cook again, to have a place where you can actually put stuff, and feeling like you’re taking off your shoes not only physically). I guess the worse part of going home is the lack of new things happening and excitements, but hey, that’s not your case.. A baby! A Flashbaby!!! Congratulations, I’ve been following your (and Curtis’) adventures and I’m truly delighted for you guys! Ok, I won’t comment on the name. But, I will comment on the fact that this is the first of seven. Remember my omen? You were married on 7/07/07. Hence, you will have seven children. … I don’t recommend that, of course, but thought it was amusing. Wow, congrats! How exciting! They’re not too flashy, but I’ve always been a fan of the names Owen & Ashley. I hear you on the adjustment back to reality. I’ve been working from home over the past 8 months (though home has changed several times throughout that duration), but tomorrow marks my first day of rejoining the organized workforce. I’m not sure what to expect! In response to the comment by Matthew, it is Bean as in the character Bean from the Ender series by Orson Scott Card. The name Bean for Lindsie’s (and Foreman’s) child first came about when Lindsie sent our parents a postcard signed by Lindsie, Curtis and Bean Foreman since baby Foreman was the size of a Bean when the postcard was sent. I honed in on the name Bean since it’s the name of one of my favourite characters from my all time favourite book. Hence, the child will always be called Bean by his crazy aunt Shelley. Hey! What wonderful photos you look great, Lindsie! We know from experience how strange the re-adjustment is, while we still to this day don’t go one day without remembering something about our own trip. Still smiling and growing bigger every day honey. What a wonderful time for you guys and for us, the grandparents. 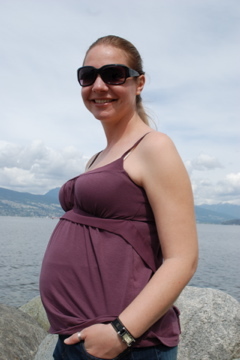 Yahoo – another grandchild this year – we are totally looking forward to the bean’s arrival!!! Also looking forward to your future posts as I am living your wonderful experience through you guys and your blogs. Love you forever, mom and dad – the future grandparents!! PS: I forgot to say that I think your pictures are fabulous as is the view behind you. Oh, Vancouver – how beautiful.